I have been dealing with violence against women therefore I would like to be the protagonist of an international film that brings a message of peace and protection to all women of the world. I had the privilege to interview actress Silvia Busacca. She is from Italy and a well known public figure in Europe. She is also known for her work as a Ambassador Model for the United Nations. Presented in 8 nations. 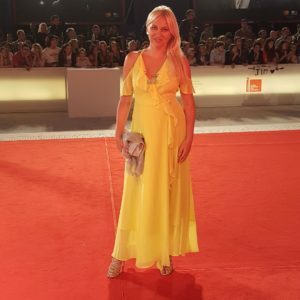 During the Venice Red Carpet International Film Festival on September 5th she was wearing a fluorescent yellow dress made by Marciano Los Angeles. She was there for the preview of Jim Carrey’s new movie Jim and Dandy. The foreign press agency took notice of her red carpet look. Read my interview to find out more about Silvia Busacca. I represented Italy 4 times in the world as prime minister of Italy in Slovenia and France as a delegate in region de Bretagne and Greece. I’ve also been in Australia as an ambassadress model united nations for Unicef Australia. In London for the government Australia. In Rome as a delegate model united nations in the world followed by the Australian embassy in Rome. But I have also been the ambassadress for UNWomen UK in international conference model united nations in Manchester and delegate for France and in Zurich. How was the Venice red carpet event? The Venice international film festival was beautiful I arrived on the red carpet I felt like Silvia of the sweet life of Federico Fellini. I was wearing an elegant yellow dress of Marciano Los Angeles for the preview of Jim Carrey’s and Andy’s movie Jim and Dandy. The movie dealt with important themes that Jim Carrey really enjoyed. I would never have expected the movie to be like this. I would give the Oscar to Jim for this movie. What type of roles do you like to play as an actress? As a new international actress I would like to play a character of a strong woman who reflects the universe of women and that the beloved ones respecting them as a women ambassador for the United Kingdom in Manchester. I have been dealing with violence against women therefore I would like to be the protagonist of an international film that brings a message of peace and protection to all women of the world. Among my future projects I would like to work with international film directors and producers in Los Angeles and Hollywood because my training course is international by Paul Haggis at Bernard Hiller at Robert De Niro, a few months ago we were shooting the scenes of an international short film in province of Benevento with the Hollywood producers taylor mane and Renae Geerlings of the Halloween I and II movie, which in America has earned 80 million. the director is Antonio Monaco and the film “At the top of the Vulcan” will be presented in Los Angeles. In the mean time I will have a lot of humanitarian projects between my international projects that will touch 15 nations in the world and 3 continents. This will become a movie the protagonists with young people from all over the world.